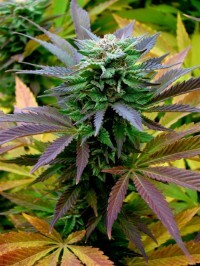 G13 is a legendary strain subject to much rumour and speculation. It has been proclaimed as the strongest strain ever created and some say it was genetically engineered by the US government in a secret CIA lab. Whether or not these rumours are true there is no doubt that this one of the strongest strains available today with very high levels of THC and buds glistening with resin. This hybrid of G13 has been crossed with an Original Haze to give it a more uplifting high while still retaining the heavy hitting indica undertones. Not for the faint hearted. Subscribe to learn about different offers, discounts, global sales, free delivery and even free seeds from famous seedsbanks.